TUCSON, Ariz. - A new spacecraft just finished a dangerous, high speed journey to Mars and made a safe landing there. A University of Arizona project helped pick the parking place for the Mars InSight lander . The new probe will work to learn what lies well below the Martian surface. They had plenty of reason to cheer at NASA's Jet Propulsion Lab in California. 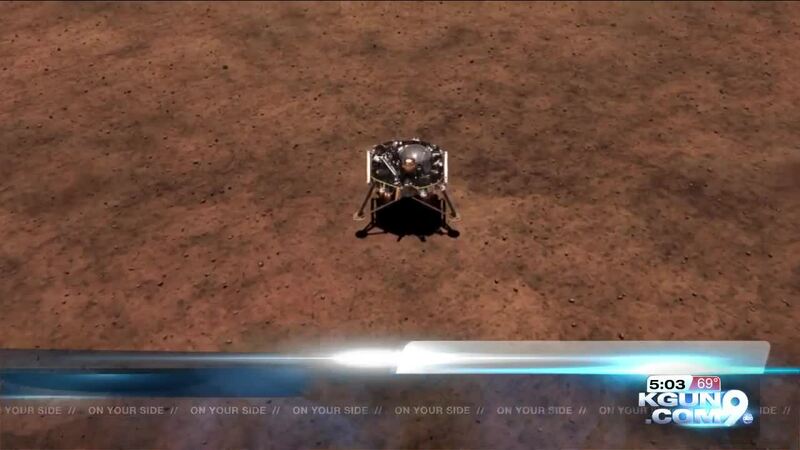 They guided the InSight lander across million of miles of space and programmed it to go from more than 12 thousand miles an hour to a safe, soft landing in just under seven minutes. At the University of Arizona, Professor Shane Byrne watched the successful landing. He knows UA helped make it a success. UA is a world leader in planetary science. It led its own Mars mission, the Phoenix Mars lander . In just a week UA's Osiris Rex probe will arrive at the asteroid Bennu and begin preparations to bring an asteroid sample back to Earth. HiRise has been orbiting Mars and studying its surface for the last 12 years. Byrne says HiRise pictures from orbit helped mission planners choose a safe place to land, "and also to look at things like how many boulders are on the surface because you don't land on top of a boulder; how rough the surface is. And we do that through taking regular pictures but also stereo pictures from two different angles so we can get an idea of how rough the surface topography is." HiRise role in site selection should help InSight find the facts it came for. The site is a hard, stable surface that will help InSight's sensitive seismographs measure Mars-quakes. “And looking at how fast those seismic radio waves arrive for different types of waves allows you to probe the interior of the surface and figure out how fast seismic waves can travel through different depths, Byrne says. “That information tells you roughly how the planet is made up in the interior." And scientists says the data InSight collects may teach us how other planets form because they believe Mars may be a model for how other rocky planets come together.